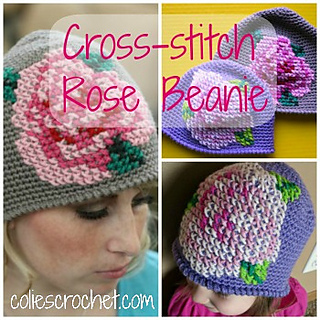 The Cross-stitch Rose Beanie is a simple beanie-style or cloche hat in construction but add in the art of cross-stitch and it really puts it over the top. 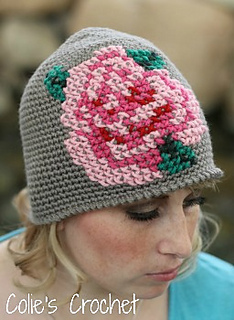 The hat features a rose that you crochet and then cross-stitch the rose design on afterwards. It is worked in sc to form the grid for the cross-stitch design. 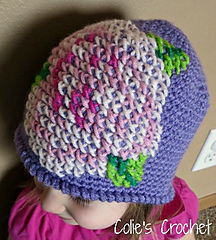 Inspired by Valentine’s Day, I created this hat for my 2-year-old daughter after seeing it in many items (mostly stool covers) that incorporated either a print or a true cross-stitch design. • Worsted Weight Yarn; I used I Love This Yarn from Hobby Lobby. 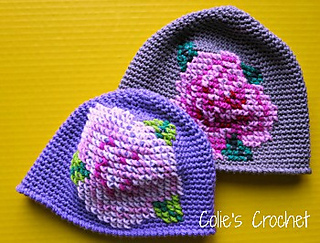 You will need up to 100 grams or 175 yards of main hat color, and 5 grams or 10 yards each 3 rose colors, and 2 leaf colors. Aran yarn would be an acceptable substitute if you don’t have access to worsted weight yarn. 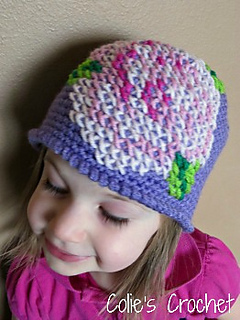 • I work this hat in an amigurumi style which means you do not join at the end of each round or chain up to begin a new round. You use a stitch marker to mark the first stitch of each round.